Lamboo Resources is also getting in on the action due to its Australian project, climbing from 7c up to an astonishing 93c in the last 8 months on the back of just a 7Mt resource, now valued at $120M. Buxton Resources (ASX:BUX) is capped at a measly $16M right now – despite having two projects uniquely placed with potential to blow up its share price if they present the markets with some juicy numbers. BUX has a tight capital structure, with top 20 shareholders owning 60% of the company. 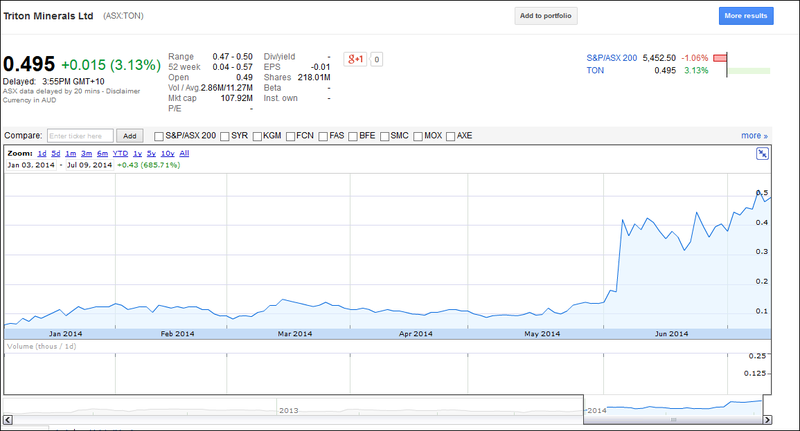 Add to this the relatively small amount of shares on issue and BUX appears to be highly leveraged to success. With $2M on hand at the end of March 2014, even following recent exploration this company should have a decent bank balance right now. But given BUX are still an exploration company, at some stage in the future they will likely need to raise more capital to continue to develop their projects. Are you a BUX investor and want to spread the word? Get the message out there – make sure everyone knows about BUX and share this article by clicking the buttons below: [sd_share_article title=”ASX Explorer in Pole Position as Electric Cars Spark Graphite Rush”] Newer readers should know that we invest in stocks we write about like BUX as a long term hold – for more information check out our Financial Services Guide and Disclosure Policy . Number one on our radar is BUX’s Yalbra Graphite Project in the mid-west region of Western Australia. 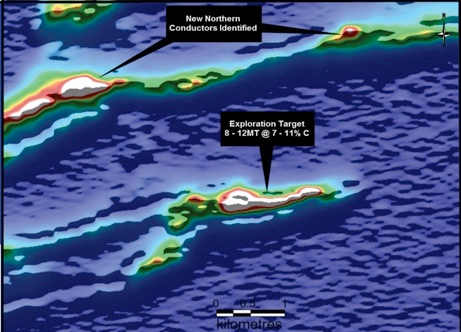 A maiden drilling program there has identified a 2.27Mt inferred resource of graphite. OK, that’s not much, but remember, it’s an initial size... and it’s still enough for an 8 -12 year mine life and some healthy early cash flow. The head turner is the purity grade of BUX’s graphite – 20.1% – with some drill intercepts returning figures higher than 30%! Graphite is a hot commodity right now, tied to the rise of electric cars that use Lithium-Ion batteries that rely heavily on graphite to work. More on that later. BUX’s WA graphite resource is the highest grade graphite in Australia right now and as far as we can see the key things holding it back at the moment are its resource size and further metallurgical results. But BUX isn’t sitting on its hands. Oh no. BUX has just completed a large scale Reverse Circulation (RC) and diamond drilling program at Yalbra and drill results are imminent. These sample results should further prove up what BUX are sitting on, honing in on % purity and graphite quantity. Metallurgy results should be a major catalyst for BUX – if these results are any similar to its higher valued peers then we could see BUX re-rated... As if that wasn’t enough, BUX has another WA mining project, this time down south in the Fraser Range near the port city of Esperance. The Fraser Range is THE place to be for Aussie mineral exploration right now... Regular readers of the Next Mining Boom and the Next Small Cap will know why we love the Fraser Range so much, but if you are new in these parts then we have two words for you – Sirius Resources – a company that went from 5c to $5 almost overnight after it found two huge nickel resources in the Frasers called Nova-Bollinger. Looks good, but just remember, analysts arent perfect – they can get things wrong – we always approach these analyst predictions with caution.  All the imminent catalysts driving the buzz on BUX’s potential. Graphite means ‘writing stone’ in Ancient Greek and for a very long time in human history that’s what people did with it – write and draw and doodle with Graphite. But in modern times we have found scores of uses for it, some humble and some so ambitious they boggle the mind. All the new graphite fuss is playing right into the hands of BUX. Graphite is a very stable form of carbon, a superfine version of coal that can absorb tremendous amounts of heat so you will see it almost every day coating brake pads. It’s why the wheels rims of your new Audi get so black between washes. Tap the brakes and graphite slows your momentum. Graphite is also used in pencils, to make lubricants, to line foundry facings and steel making. 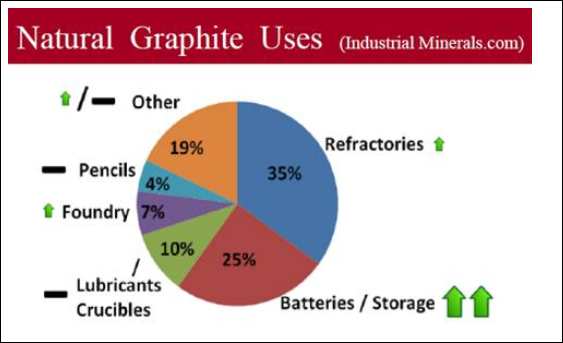 All of these materials provide a constant demand on the world’s supply of graphite and are the industry’s regular cash cow. The Royal Geological Society has listed graphite as a strategic mineral – basically because it’s extremely useful, yet hard to get your hands on. But forget pencils. What’s getting the markets hot and sweaty right now is graphite’s use in electric car batteries. Lithium-Ion batteries contain loads of graphite – there are 10 times more graphite in these batteries than lithium) and are used in electric cars, an industry that’s growing leaps and bounds as more people buy cars like the Toyota Prius and American cities like St Paul embrace charging stations to allow them to recharge. The Lithium-Ion batteries used in a Nissan Leaf have over 40kg of graphite! Car manufacturers are falling over themselves to do a Bob Dylan and go electric. Mercedes-Benz, BMW, and many others are all plugging in to Lithium-Ion batteries that use graphite. 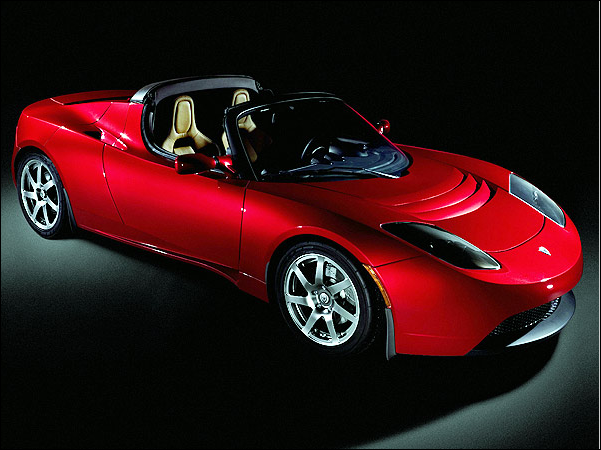 The International Energy Agency reckons there could be 20M electric cars on the road by 2020. That’s a lot of graphite to sell! A few batteries here and there is all well and good, but now let’s look at something truly space age and with the potential to truly boost the demand for graphite once and for all – a gigafactory. A gigafactory is a fancy name for a large battery making plant. US electric car manufacturer Tesla is planning to build one – no word yet on where or when – but CEO Elon Musk reckons the global auto industry will need 200 such plants by the year 2040. Musk says the gigafactory will cost $5BN to build and produce enough batteries for half a million electric cars by 2020. Panasonic is the factory partner – making batteries for its sophisticated line of consumer electronics that use similar tech to Tesla’s power plants. 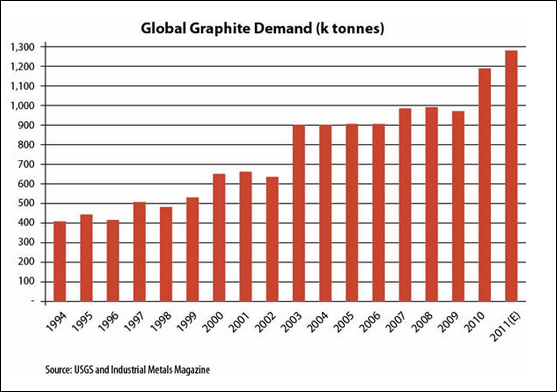 Sounds like a lot of graphite demand to me... maybe BUX can one day help out with a high grade Aussie resource? In what could be a globally significant tipping point, Tesla has also announced it will not contest ANY of its patents . This throws open the doors to new manufacturers who can now use Tesla’s technology for free – this could finally lead to the creation of a global electric car industry that could one day overtake and destroy its internal combustion rival. They may need more batteries than they thought... All of these batteries will use graphite in some shape or form. All of them. 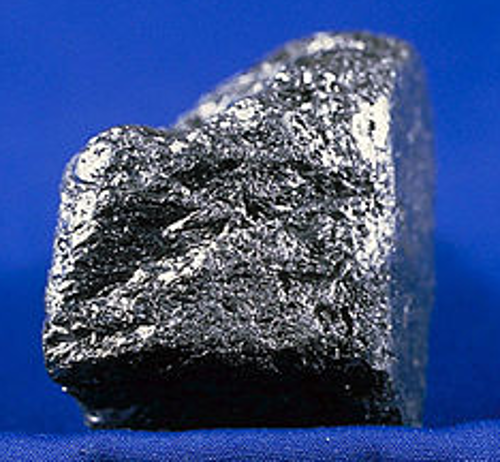 Electric cars and consumer electronics represent a tangible outlet for the world’s supply of graphite. For years China has held sway over graphite but its stocks are running out! All of these growing waves of demand for graphite has caused a surge in graphite exploration companies – we think BUX will next, that’s why we have in them. Then there is graphene – a super strong substance made from graphite that is 200 times stronger than steel. Basically, graphene is a sheet of graphite one atom thick. In 2010 two scientists won the Nobel prize for their work on graphene and a few years later some Irish scientists discovered how to make graphene using a kitchen blender, some lead pencils and washing up liquid! The graphene phenomenon has sparked a global race to sew up the rights to just about every application for it you can think of from electronics to plane wings, car bodies and military equipment. Graphene is still very much a future application for graphite – but nevertheless there is a scramble for companies to unearth suitable graphite that can make graphene. Some commentators have raised concern that Syrah, capped at $700M, with a mammoth 382 Mt resource, might fill the entire supply side of graphite, leaving all competitors in the dust. But recently China’s Chinalco, the third biggest aluminium producer in the world, has signed an agreement to take up to 100,000 tonnes of Syrah’s future output, putting it to use in yet another new end market – aluminium anodes. 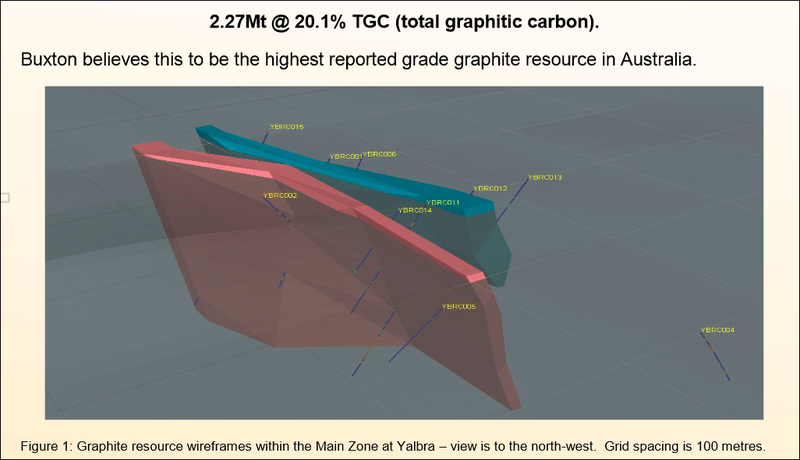 OK, so BUX has 85-100% ownership of its Yalbra graphite project in Australia which has a pre-upgrade JORC resource size of 2.27Mt with a JORC resource grade of 20.1% TGC (Total Graphitic Carbon), giving it a market cap of $16M. The only unknown is the metallurgical properties of the resource. That will come with time and drilling. The next few weeks should further define what BUX are sitting on. 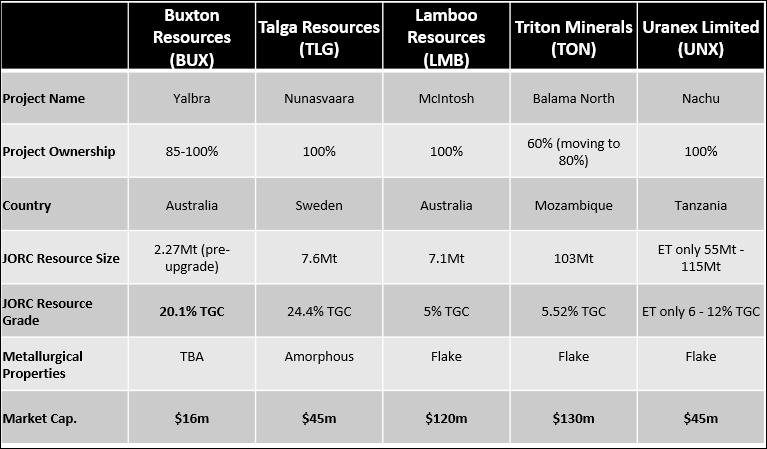 Right across the board, BUX compares quite well with four established ASX listed graphite competitors; Talga Resources, Lamboo Resources, Triton Minerals and Uranex Minerals. BUX is the minnow of all of them, capped at just $16M – that’s with the Fraser Range nickel play added in. Back to graphite, the only category BUX suffers in is JORC resource size. Its 2.27Mt prospect is dwarfed by the 103Mt resource controlled by Triton Minerals. The other three are all bigger too. Talga has 7.6Mt, Lamboo has 7.1Mt and Uranex has an exploration target between 55Mt and 101Mt. But, bear in mind that BUX’s 2.27Mt is a pre-upgrade figure, and it’s still enough for an 8-12 year mine life. At this early stage, it’s a guesstimate – the tip of the spear of what could be in the ground. Plus BUX are applying for licenses in the direction of strike. So when a full scale exploration program gets underway, that 2.27 Mt figure could start to creep up to those more established graphite projects. The category where BUX truly shines is JORC resource grade – 20.1% TGC. 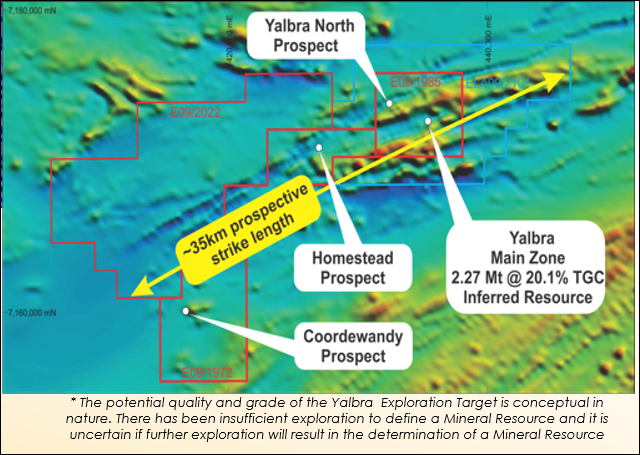 The Yalbra resource is the highest grade in Australia. The only graphite source with a higher grade in the above table is the Nunasvaara project owned by Talga – 24.4% TGC. Impressive grades, and they are targeting some hi-tech graphene applications, but the graphite there is amorphous – BUX are chasing flakes. BUX has flake graphite in the ground, the good stuff – We just don’t know how much flake graphite yet. If BUX can confirm a 2Mt plus resource of high quality flake graphite with high grades then we would be suitably impressed... The second category that BUX’s excels is in its country of operation – Australia. Yalbra is in Western Australia where the mining industry is the be all and end all. From the forests of the South-West to the arid deserts of the North-West just about every possible mineral that can be dug up and sold is being dug up and sold. Almost the whole state of Western Australia is geared to mining – it makes 90% of its income from the industry. The risk BUX encounters operating a graphite mine in Western Australia is minimal. The work force is first rate, the infrastructure is modern and plentiful and the government is stable and effective. 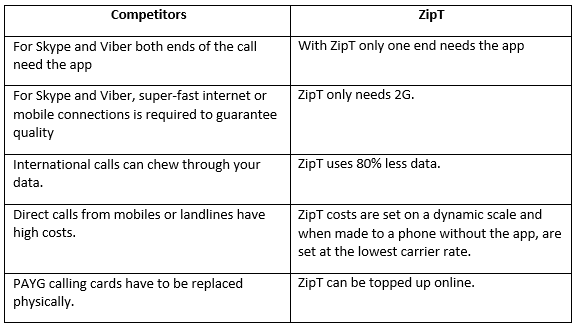 Compare that to Triton and Uranex who operate in Mozambique and Tanzania respectively. The risks of operating in Africa are higher than Australia. Infrastructure can sometimes not be as good, the political winds can change direction very suddenly and much time and effort needs to be invested in developing the work force. Best of all, BUX’s market cap is low, just $16M compared to the $120M market cap Lamboo has with a 7.1Mt flake graphite resource of just 5% TGC (Total Graphitic Carbon) grade. Lamboo has already seen tremendous market growth. It bears repeating. BUX is valued at $16M with a 2.27Mt graphite resource with a grade of 20.1% TGC. We think BUX is severely undervalued on the ASX and its low market cap means investors have the chance of seeing their support grow in value as BUX realises its potential. There are many graphite miners further down the road than BUX, but at The Next Mining Boom we reckon none of them have as much potential for investors, either due to already realised value or a lesser quality graphite project. Throw in the Fraser Range nickel project as well! BUX’s Yalbra Graphite Project is rated as having the highest grade resource of graphite in Australia. 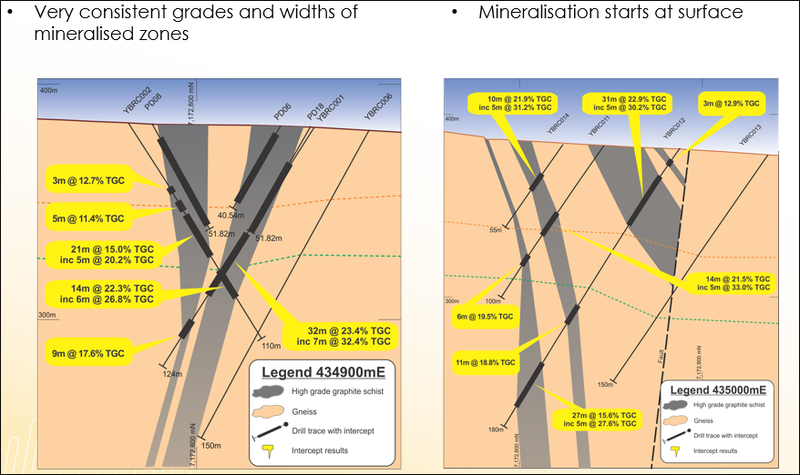 The company’s maiden drilling program in 2013 intersected numerous zones of high grade graphite, giving it an inferred JORC resource of 2.27Mt at 20.1% TGC (Total Graphitic Carbon). You guessed it, the grey stuff is the high grade graphite. This is just one area of BUX’s graphite tenements in Western Australia. 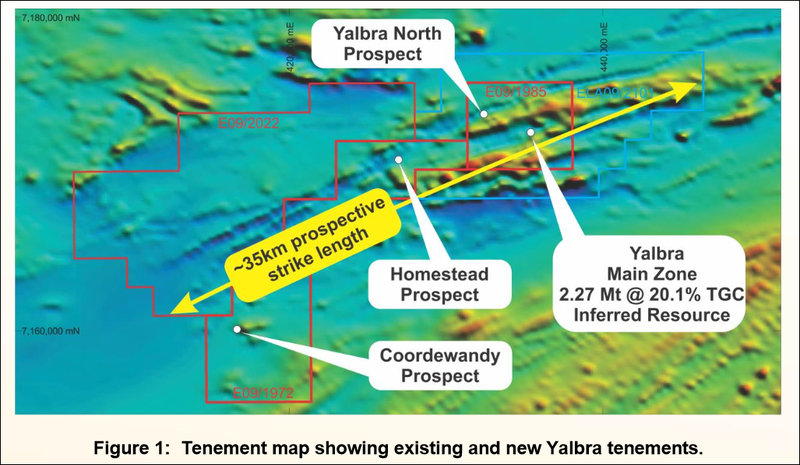 There’s another target in the Yalbra North zone and the two new tenements, Coordewandy and Gum Creek Graphite are part of the same strike zone. 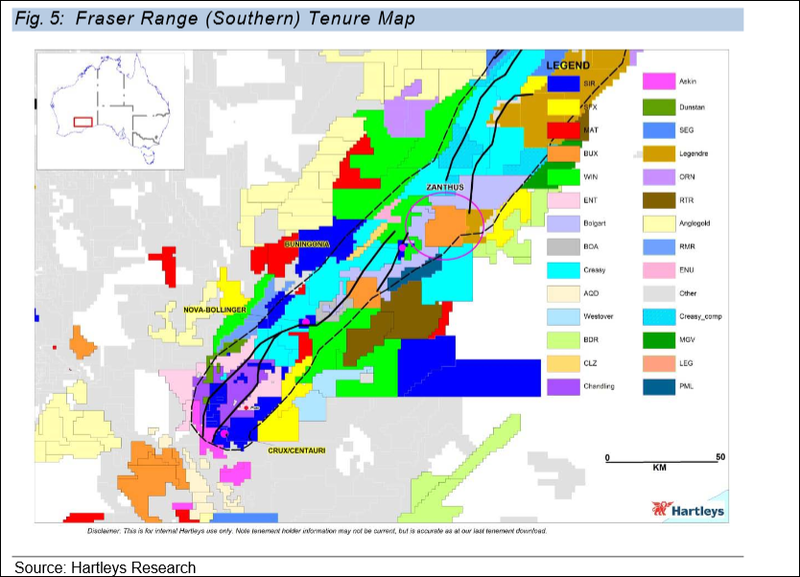 BUX has a 2.27Mt resource (pre-upgrade) at 20.1% TGC at Yalbra Main so far. Hopefully a nice juicy resource upgrade can follow from these drill results, but another crucial thing is the metallurgy of BUX’s Yalbra project. All will be revealed shortly, once the laboratory testing is completed on the fresh Yalbra samples just dug up during the RC and diamond drilling program. What they find will determine everything, because not all graphite is equal. Basically, there are two types of graphite – graphite flakes and amorphous graphite. Geological attributes aside, jumbo flakes are the most lucrative, with an estimated sale price of $1,600 /tonne while amorphous is cheaper selling for $500/tonne. It began in September of 2012 when NBH helped BUX with a $2.1M strategic capital raise taking a 15% placement of shares in the company worth $1.5M – this was effectively at 35c when BUX was trading at 17c. 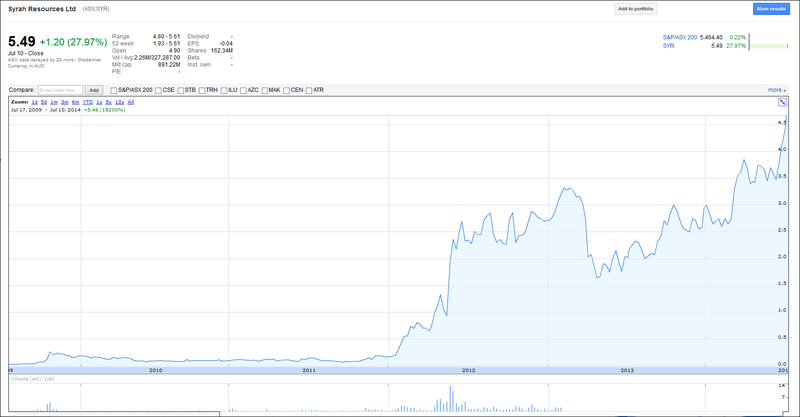 NBH repeated that in March of 2013 with a $2.3M capital raise, which was undertaken at a share price of $0.46... much more than BUX’s current share price. We are glad we have made our recent investment at a lower price than the two big NBH capital injections... The $2.3M capital raise included a further uptake of BUX shares and support from a Hong Kong resources fund, a private equity firm, and institutional and sophisticated investors. NBH can turn on the money tap for BUX – it’s done it twice and we dare say it will do it again – so investors can see that BUX has solid financial backing from one of China’s elite investment groups. This Chinese connection will be invaluable when the time comes for BUX to find buyers and strike deals for any confirmed graphite resources it has out at its Yalbra Graphite Project. But BUX doesn’t have to travel all the way to China to connect with the world’s second largest economy. Just look in the board room. Non-Executive Chairman Seamus Cornelius has been living and working as a corporate lawyer in China for 17 years. He has been based in Shanghai and Beijing since 1993. Cornelius has 21 years of corporate experience in both legal and commercial negotiations and is considered a specialist in cross border investments focussed on energy and resources – like graphite. He is BUX’s man in China, the leader with the local knowledge and connections. He has advised large international companies on their investments in China and advised Chinese state owned entities on their investments in natural resource projects outside of China including in Australia. OK, so that’s the top of the table sorted. How do the rest of BUX’s leadership team get on with China? Non-Executive Director Xiangzhou Liu has spent over 16 years working in senior finance roles with financial institutions and investment companies in China and the United States. Oh, and right now, Liu is the Deputy General Manager of National Business Holding Co. Ltd, BUX’s major shareholder... He is directly responsible for managing NBH’s corporate and financial strategies – a good bloke to have around! Liu has also worked as the Deputy Manager of International Trade for China Bank of Communications, a major Chinese financial institution. BUX’s connections with China run deep. Its major shareholder NBH is a powerful Chinese investment group. Its Non-Executive Chairman has lived there for years and one of its Non-Executive Directors has a senior role at NBH. NBH has twice helped BUX raise millions of dollars, the last time at a premium to the current share price, so it can continue to develop its mining assets including the Yalbra Graphite Project. When the time comes to dig deeper, BUX should have strong financial backing. When the time comes for BUX to sell its graphite, we’re betting NBH will have customers set up and ready to sign on the dotted line. BUX isn’t just concentrating on graphite. It’s also a major player in the nickel rush underway right now in Western Australia’s Fraser Ranges. Essentially in the $16M BUX there is the upside potential of both graphite one of the hottest commodities right now, and the Fraser Range – the hottest exploration postcode in Australia... Unless you’ve been living under a rock you’ll know the incredible story of the rise and rise of Sirius Resources – a company that went from 5c to $5 almost overnight after it found two huge nickel resources in the Frasers called Nova-Bollinger. The Nova-Bollinger discoveries sparked the great nickel rush in the Fraser Range and made instant fortunes for the investors who got in on the ground floor. The past performance of this product is not and should not be taken as an indication of future performance. Caution should be exercised in assessing past performance. This product, like all other financial products, is subject to market forces and unpredictable events that may adversely affect future performance. Now, prospecting is a mix of science and luck and there are no guarantees in this business. But a big reason The Next Mining Boom has invested with BUX is that we reckon it has a chance of repeating Sirius’ success in the Fraser Range. Sirius’ big Nova discovery is a magmatic nickel sulphide deposit that is part of a geological structure known as an “eye” due to the circular magnetic reading it shows on surveys. The other deposit, Bollinger, is a dominantly flat lying body to the east. The key thing here is geology – the age of the rocks, the degree of metamorphism and deformation, the ratio of copper and cobalt to nickel and the association of mafic intrusive rock. If all of these things are present you will very likely get a big nickel sulphide resource like Nova-Bollinger. Now, consider this. 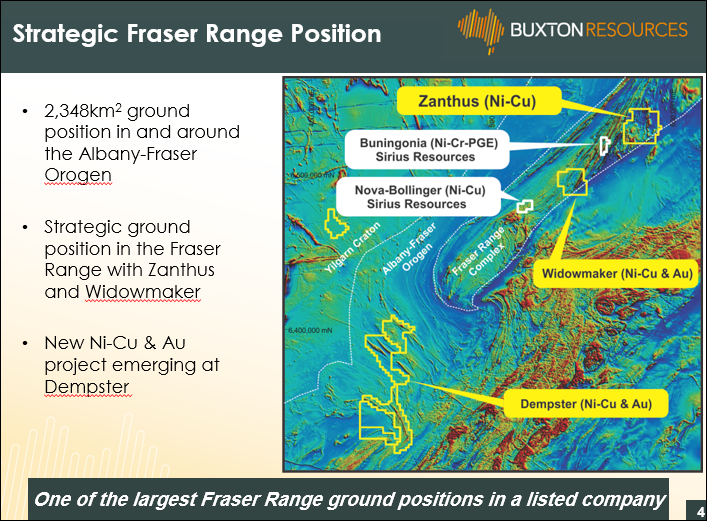 BUX has one of the largest ground positions in the Fraser Range belt with two main projects – Zanthus (Ni-Cu and Magnetite) and Widowmaker (Ni-Cu and Au) – covering 592km2 together. Both projects are on the same strike as Sirius’ Nova-Bollinger discoveries with Zanthus 60km away and Widowmaker 22km away. Within the Zanthus Project it’s just uncovered the “Oaktree Prospect” – a new target where a fresh round of ground EM surveying is underway – more on that in the next section. BUX is operating in the exact same area as Sirius and both the Zanthus and Widowmaker projects have shown through early drilling and surveys to have similar geological features as Nova-Bollinger. We will know more when BUX drills. But the early results are a good indication of what could be confirmed soon. An airborne VTEM survey at Widowmaker identified seven priority targets for an aggressive exploration program. Out at Zanthus, gravity data has shown signs of an “eye” just like the one that gave away Nova’s existence. Plus, the EM survey underway at Oaktree could turn up something big too. Before we go any further, we need to dig down into the geology a bit more so you’ll be able to understand why we’re so interested in BUX’s nickel in the Fraser Range. 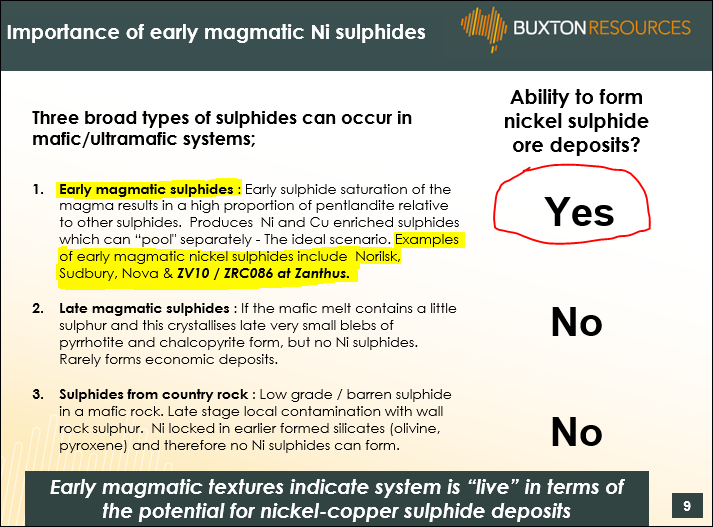 BUX’s nickel prospects there have what’s known as ‘ magmatic’ nickel sulphides within ‘ ultramafic’ rock. Ask your local geologist – Those two things together are the holy grail of nickel exploration. Magmatic means a molten substance beneath or within the earth’s crust from which igneous rock is formed – also known as ultramafic rocks. The Fraser Range was formed millions of years ago by volcanic activity and the thing that helps forms nickel – sulphides – settled there in three different ways, forming three different types of nickel deposits. Only one forms a nickel sulphide deposit – early magmatic sulphides. This type of sulphide deposit forms early in the volcanic cycle, producing pools of nickel and copper. This is ideal – and is what makes up the Nova deposit, the resource discovery that sent Sirius’ share price into the stratosphere. The other two types you can find are low concentrate deposits. 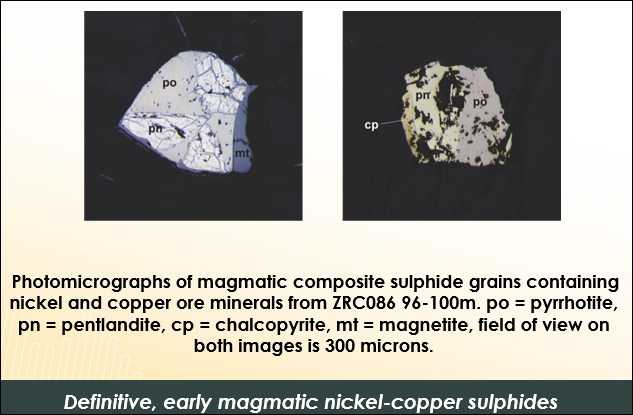 Late magmatic sulphides have a small proportion of sulphides but no concentrated nickel sulphides. It’s rare to get an economic deposit from these, it’s kind of like skimming a pool for leaves. Sulphides from country rock are the lowest grade, forming the latest so any nickel is either contaminated by other materials or locked inside silicates. No nickel sulphides can form and if you get one of these it’s a big fat zero. In August of 2013 BUX conducted a HeliVTEM survey over its E28/1959 tenement, a form of electromagnetic surveying done by helicopter. What they found was a number of gravity anomalies, major structures and geochemical anomalies that led to 18 EM targets that were drilled in the first exploration program. Chock a block with pentlandite. You get this sort of thing in a Proterozoic orogen – a place where millions of years ago the earth’s crust bunched together and formed mountains – like the Fraser Range. So far, drill results to date have been encouraging rather than outstanding. But Sirius’ first up results at Nova didn’t set the world on fire either. 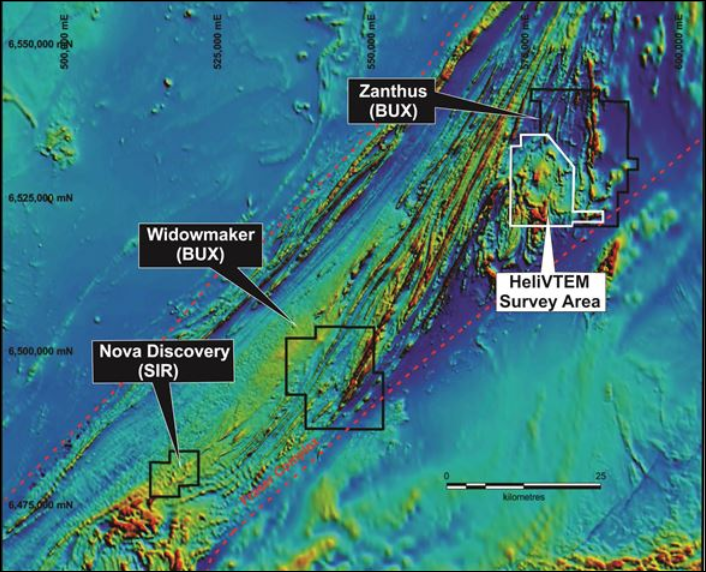 At Sirius’s Nova deposit, initial drill results were pretty ordinary in terms of grade (like 0.1% nickel) – but the point was that it was the right environment for the presence of the important stuff. Nickel sulphide deposits. As long as the geology is right and demonstrates the right environment for some big early magmatic nickel sulphides, the results have a good chance of improving. Like Sirius in the early stages, BUX has also identified what it’s calling a “fertile” project at Zanthus that has the potential for discovery of an economic resource of Ni-Cu mineralisation. If you are new to our site, you may not have seen our Next Oil Rush Tip of the Decade – which called Africa Oil Corp (TSX:AOI) at around CAD$1.8 . 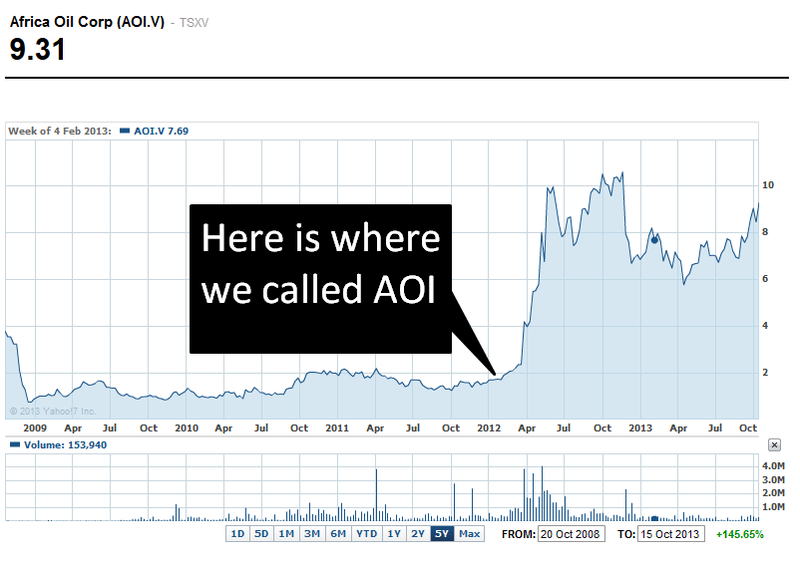 AOI has been as high as CAD$11.25 since – that’s over 600%! His last job was as BHP’s Senior Exploration Manager for both North and South America. Before that he was WA Exploration Manager for BHP. Before that he was in nickel exploration in WA, beginning his career at Kambalda Nickel. Basically he’s BHP’s go to guy for nickel... and now he is a Director at BUX. The rush for nickel in the Fraser Range is accelerating and competition is fierce. BUX has the biggest land holding with some of the best prospects going. But if it’s going to succeed it needs a steady hand on the tiller. We look at Fogarty’s CV and see a man who knows what he’s doing. We can bang on and on about BUX’s resource assets, but the assets that really count are the people running the show. You don’t become the Senior Manager of BHP’s North and South America exploration program with a head full of rocks. You get that job because you know how to take a prospect into production. BUX’s board are experts in their fields. They have the connections, the experience and the ambition to make BUX’s resource double play – graphite and nickel – the next big thing in Australian mining. The Next Mining Boom is investing with BUX because it has high quality assets being developed by high quality people. OK, so what’s next for BUX? Right now BUX is waiting for the lab results of samples taken from its Yalbra Main graphite prospect during an RC and diamond drilling program. BUX says the results will be released as soon as they come to hand – it could be just days or weeks away. There is no guarantee BUX’s latest round of drilling at Yalbra will turn up a golden ticket for the company. But BUX has already proven a 2.27Mt resource at 20.1% grade – the highest quality graphite resource in Australia. Remember some BUX grades have even reached as higher than 30%. And 2.27 Mt is enough for a mine life of 8 – 12 years. 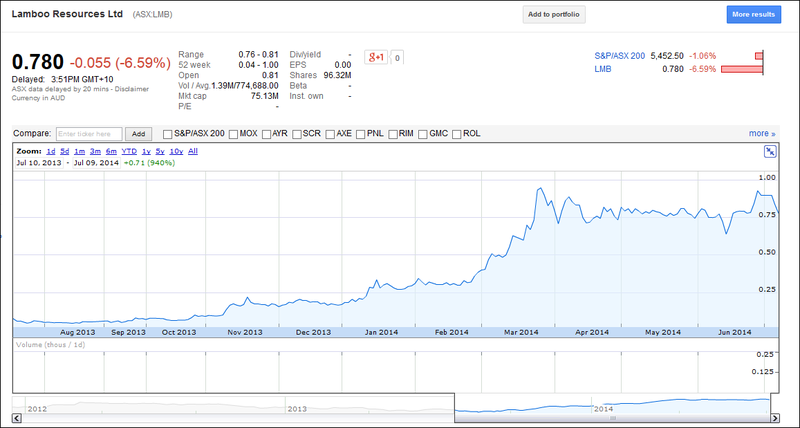 So we’re happy to take our chance in BUX’s graphite grab and have invested in the company as a long term play. Drilling results are imminent – any day now – and we’re glad we’ve got our ringside seats. It’s a similar story at its Fraser Range nickel project where BUX has a new round of ground EM surveys going on at its Oaktree Prospect, part of its Zanthus nickel project. This is a precursor to a more detailed drilling program, so the aim here is to find some fat juicy nickel targets and then go after them with a full scale drilling program later. 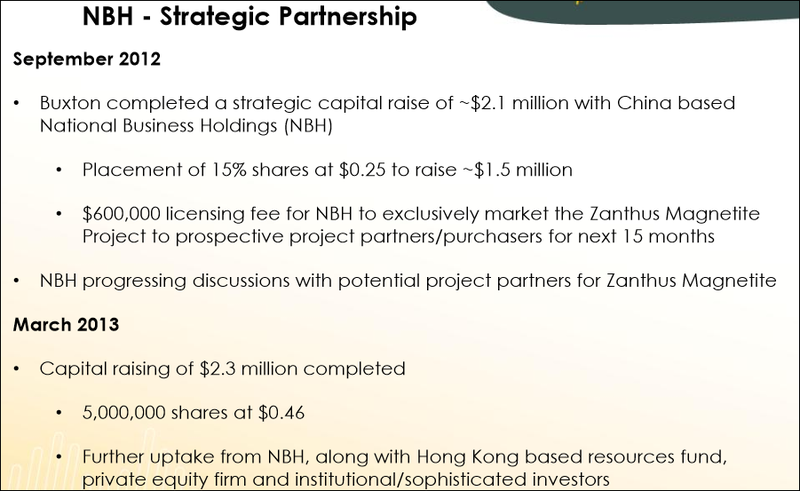 Even after this quarter’s exploration work, BUX should be cashed up with more than $2M in the bank as of March 2014, a phone a friend relationship with NBH (one of China’s most powerful foreign investment bodies) and a leadership team with deep expertise, ties and experience in nickel and graphite. BUX is in a really sweet spot right now, doing the crucial spade work like drilling and surveying as its market cap is low ($16M) and its share price is undervalued. But once all of its catalysts start rolling in, the bargain basement price we have snapped up BUX for now may be long gone. Price jumps aside though, BUX is more than a quick buck operator. It has identified two markets – graphite and nickel – that it can create niches in and turn good profits for a long time. That’s why The Next Mining Boom is backing BUX for the long term.